It was fine. We were unloading in the middle of a downpour, and another customer wanted us to move our 20' uhaul so they could drive past, rude! We didn't move. Moved in the middle of a downpour, but overall, a good experience. Thanks to spare foot, I was able to get my unit, move stuff in, and be happy and secure. Friendly staff, prompt service, would def recommend! I had a wonderful experience here. The staff is very friendly and helpful. Move in truck is a great feature. Thank you Eric! 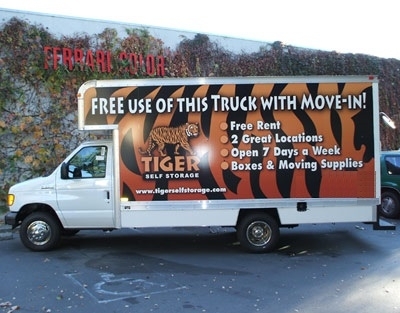 It was our pleasure making your Storage rental experience "five star". Customer service was great. Willing to work with me on what size we were renting and got us in a unit 20 minutes after we called. When I arrived, the staff was welcoming, informative and friendly. Our transactions went very smooth. We could not be happier!! 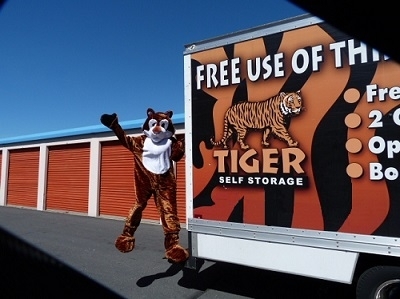 Thank you for choosing Tiger Self Storage for your Storage needs. It was a pleasure to serve you. Unit was secure,clean and ready to move in without any snags!! Customer service was a bit jumbled. No one really knew policies or anything. Very nice people who run the facility. Price were too high once my special rate from Sparefoot ended. I wish there could have been gate access after 7pm. Overall good experience. I feel the monthly rent is too high but I needed a place that had a first month free deal. I hopefully will not need it more than a month but I am happy with the deal I got. Great customer service. Overall pleased with the place. It was was easy to find, easy to move in, and paperwork went smoothly. Great storage place! Easy, hassle-free, affordable. Super friendly and sweet! The woman who worked at the front desk was a little stern. She almost came off as rude. Maybe she just had a long night or something because she didn't seem friendly. Overall, the paperwork was easy to fill out, access to the facility was easy, there were quite a few cobwebs in my unit, and the manager came off as stern/grumpy/blunt. Everything went well with my move, the 5X5 storage was enough space, more space than I thought. There were hidden fees that I had to pay that were not advertised. That was a bummer, so I ended up paying double, that ruined my budget. The staff was friendly and nice, but had to search for my reservation, I'm glad I had a text notification to show and remembered someone from TigerSelfStorage had called me the next day after I made the reservation. The staff was nice, the place seemed clean and secure. The price was very good. The units are a little smaller than advertised. Not 10 foot ceilings, the "10 foot" units are really 9 feet, etc, because they measure from the driveway to the back of the unit, not to where the door closes. Still worthwhile considering they are the cheapest by miles. It has been wonderful. The staff was very nice and helpful. Thank you Paulette. It was a pleasure to serve you. Thanks Bruce. We appreciate your buisness. Thank you Zachary. It was great to be of service. Thank you Pamela. It was a pleasure to serve you. Was great experience getting the contract signed, borrowing the truck to aid in move in and actually getting moved in. Presently a happy customer.